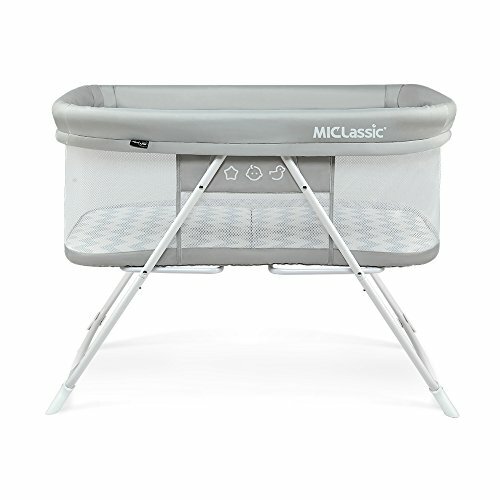 If you have been looking for a crib that you can use at home and also easily take on the road with you when you travel with your little one, then the MiClassic 2-in-1 Rocking Bassinet Travel Crib may be your answer. This nifty sleeper has the option of rocking back and forth, or the legs can be set to stay stationary. The switching back and forth is a quick and easy process. The nice thing about this bassinet travel crib, is that it easily folds up and fits into the travel bag that is included. This is a big enough bassinet to also use as a diaper changer on the road or at home. The length is 36.6 inches while the width is 22.2 inches. It stand 28 inches tall. This is a roomy sleeper for an infant. The maximum weight limit is 33 pounds. It is not safe to use once your child can pull him or herself up, so chances are your baby will outgrow the MiClassic 2-in-1 Rocking Bassinet Travel Crib before he or she reaches the maximum weight limit. The MiClassic 2-in-1 Rocking Bassinet Travel Crib only weighs 15.6 pounds. This makes it very easy to carry and travel with. The dimensions once in the bag measure 22.8 inches by 20.7 by 6.7 inches thick. Let's take a look at what parents who bought this bassinet travel crib thought about it. One-second open&fold system makes bassinet easy to transport or store. Please have a "QUICK PULL UP" to fold it! Most of the parents who bought the MiClassic 2-in-1 Rocking Bassinet Travel Crib liked this cool little sleeper. I've read all of the reviews and broken down and summarized the most popular topics into some categories. I hope this makes your shopping choices a little easier. Many parents were concerned with the crease down the middle of the bassinet. This is where the crib folds. Some initially thought that the crease would be uncomfortable for their baby, but then found that it was not a problem. Parents said that with a sheet on, you couldn't even notice the crease. Others said that they put a quilted blanket down first so that the crease was not noticeable. Babies seemed to enjoy the comfort of this bassinet travel crib. Parents were surprised at how much room there was in this bassinet travel crib. Some called it XL in size. One did take it back because they didn't realize how large it was. So make sure to read the dimensions listed above if you have a tight space to fit this in. Most parents, though, were pleasantly surprised by the large size for such a lightweight and easy to transport bassinet travel crib. The price is right on this bassinet crib. It is inexpensive without sacrificing quality and durability. This is a nice economy crib that can be used as your baby's main sleeper up until they can get up on all fours, or until they reach the 33 pound weight limit. Parents seemed to really like how easily this bassinet travel crib folded up. It folded up so easily and quickly, that some even folded it up everyday at home. One parent summed up a lot of other parents' thoughts when she wrote, "I really like this bassinet. It folds up very easily and is great for travel. I even prefer to use it at home over the crib. I just fold it up and put it aside during the day, then pop it back up at night so that my baby sleeps right next to my bed. It is bigger than most bassinets, and it does take up more space. But,being able to fold it up so easily and keep it out of the way when not in use makes up for the larger size." It eased many parents' minds that their babies could sleep in their own beds while traveling. One parent said, "We used this on a road trip. If you bring it on as your carry on it would be fine. It folds up nicely and comes with a carrying bag. It's definitely worth the purchase. This gave me peace of mind that my baby always had a safe place to sleep in all the hotels during my 4 week road trip." With lightweight and folding furniture, sometimes durability and stability are compromised. But that doesn't seem to be the case with the MiClassic 2-in-1 Rocking Bassinet Travel Crib. Parents liked the rocking feature, but also liked how the legs could easily be set in a stationary position. If you don't like a bassinet to rock, you could choose to never set the legs for the rocking feature, or enjoy that you have options that can be easily switched. This is a nice bassinet travel crib that can be used as your baby's main sleeping bed when he or she is tiny. It has the cool option of being able to rock or stand stationary. I like that it folds up quickly and can be easily carried. It does not weigh much, so traveling with it should be a piece of cake. It is larger than many parents realized, so make sure to read the dimensions listed in the product description if space is limited. This is a durable and stable piece of equipment. I hope my review of the MiClassic 2-in-1 Rocking Basinet Travel Crib helps you decide if this is the right baby crib for your family. To read all our baby crib reviews, check out our article, The Top 10 Baby Cribs of 2018.